Tony Blair may not have been feeling this way as he walked to the podium this morning, but he was probably quite fortunate. Not because he was in and out of Glasgow long before anti-war protestors descended on the conference centre. But because the report from Hans Blix did not trigger the expected US and British move towards a second resolution, the air of direct confrontation between Mr Blair and his anti-war critics did not materialise. There is yet another pause whilst the UN ponders how much longer to give the inspectors. So Mr Blair could afford to direct his speech to party members inside the hall rather than the public beyond. Mr Blair fleshed out what he sees as the moral case for the removal of Saddam Hussein. Irrespective of whether they are New Labour or Old, war is a subject that cuts to the core of those members beliefs. The tradition of hostility to military action is in the warp and weft of the fabric of Labour. That most reviled of Labour Party leaders Ramsay Macdonald had been a hero of the pacifist left when he opposed Britain's involvement in the First World War. In 1935, George Lansbury quit as leader, following a devastating speech from the union leader Ernest Bevin, who derided him for "hawking your conscience" around Europe in the effort to prevent another world war. For Labour politicians like the Foreign Secretary Jack Straw, those are not mere episodes in history. Although his father was a pacifist, Mr Straw believes Labour was on the wrong side in the 1930s. Failing to confront the dictators delayed not prevented war. 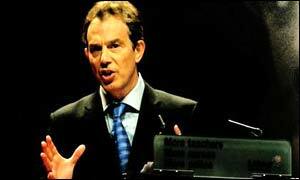 It is because Labour delegates tend to be so conscious of their party's history - and certainly on the left, suspicious of party leaders - that Mr Blair pitched his anti-Saddam message as part of a consistent Labour tradition. Yet Mr Blair has changed his party, as was clear by his reception this morning. There was no heckling, no walk out by protesting delegates. Gone are the days when a leading left-wing figure like the late Eric Heffer would storm out half way through the leader's speech (because Neil Kinnock had attacked the party's running of Liverpool City Council). It is now impossible to imagine a repeat of the extraordinary scenes in 1976 when the Chancellor of the Exchequer, Denis Healey, was heckled throughout his speech as he tried to explain why the Government had bowed to the demands of the IMF. But it would be wrong to think that Labour Party members have been cowed. They have not. Throughout his speech, some held up posters with the slogan "No Blood For Oil". The applause in the sections on Iraq was polite but brief. Mr Blair and his advisers are under no illusions about the depth of feeling or the difficulty of changing hearts and minds. But Downing Street stresses that this is not a change of government policy. That's still to bring about the disarmament of Iraq. Instead, the departure of Saddam Hussein is part of Labour's moral and long established belief in liberating people from dictators. In other words, Tony Blair is not clinging onto the coat tails of a Republican President playing out the last act of a family revenge drama - as some of Labour's anti-war campaigners believe. Instead, this is a Labour Party leader acting within his party's tradition. It is just possible, of course, that the prime minister doesn't believe he can make converts within his party. A pessimistic assessment would be that it's now late; war has become inevitable, probably without a second UN resolution; and that Mr Blair will back President Bush. In those circumstances, he would find himself in conflict with much of his own party, not least a significant number of Labour MPs. There are many "ifs", of course, but at that stage could begin the dark mutterings against Mr Blair's continued leadership of the Labour Party. It's then that the case for the defence would require some evidence. At the heart of that evidence might be the case Tony Blair made today for going to war in the defence of the Labour Party tradition.